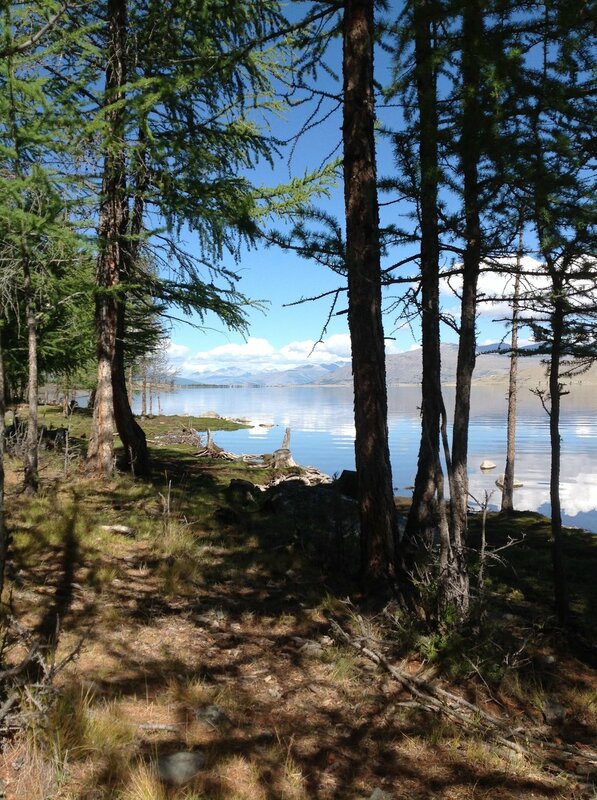 We set off early from the above coordinates and continued walking along the edge of the lake, as close to the water as we could, regularly coming across herds of yaks and sheep grazing. Occasionally, in the distance a couple of young children played in front of a 'ger' or yurt. Walking on this side of the lake meant walking through patches of fairly dense larch forest. We also walked through quite boggy terrain surrounding meandering creeks and brooks that empty into the lake. We had to cross many of these waterways by taking off our shoes and wading through calf high water. Today it took us a while to figure out a way across the delta-like network of streams emptying into one side of the lake. We took off our shoes and waded to sandy islands that deceivingly seemed to offer a shallower place for crossing. Soft and spongy, the grass underfoot squished between muddy toes half expecting to be jabbed with a stick or rock. While on one of these sandy islands vegetated by bushes and water grasses, we noticed big weather building up in the north on this side of the valley and in the distance heavy water fell on happy pines on our side of the mountain. We hurried to get our wet weather gear out and scrambled to take cover in between the branches of a small, bushy tree. In our plastic pants and rain jackets, bare feet (cause we had been wading) we sat there for 15 minutes while the rain came down of us in buckets. Grateful for wet weather gear we continued until we found a way across this wetland section of the lake. We camped only 6 or 7 metres form the edge of the Lake, the water lapped the mossy pebbles all night while a full moon and a warm fire made it a very peaceful. My wet shoes dried completely next to the fire.